Directions: To the west, about 50 yards away, is The Struggle for the Mountains Interpretive Sign [ Waypoint = N37 37.243 W90 38.376 ]. 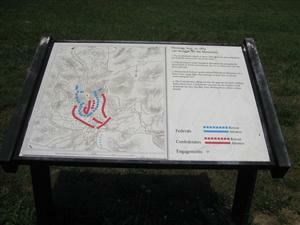 Walk over and read the text on the Interpretive Sign. 1. The Confederates attack at dawn. Outnumbered and outflanked, the Federals retire to the mountain slopes. 2. Federal infantry holds Shepherd Mountain but are gradually forced back to avoid encirclement. By 10 a. m. they retire into the fort's rifle pits. 3. Dismounted Federal cavalry defend Pilot Knob Mountain. In a bitter close-range fight, they manage to hold their positions overlooking the fort. 4. The Confederates advanced into the gap but the fort's artillery drives them back. Confederate cannons on the heights could dominate the fort, but Maj. Gen. Sterling Price orders a direct assault.